I haven’t posted in quite some time. My apologies. Life has been doing a wonderful job of getting in the way, but I promise to make it up to you. I’m starting with two reviews in one day! 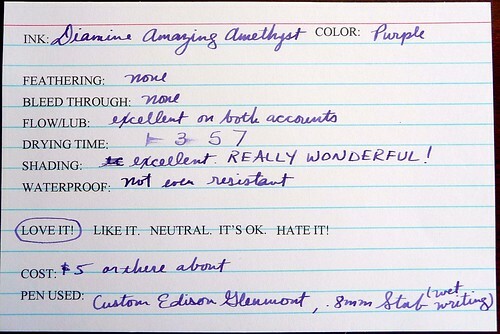 Up first is the lovely Diamine Amazing Amethyst! This is probably my favorite Diamine ink at the moment, and my favorite dusky purple. I bought this to go with my new Edison Glenmont (review coming later this week) because I thought the color would go perfectly with it. Alas, it does not. This is a bit more blue than my Glenmont. Even still this ink has a very permanent and prominent place in my collection! I’d describe this color as a Dusky Bluish-Grey-Purple. It lacks the reddish undertones of Diamine Damson or JH Poussière de Lune. This ink does not feather or bleed through any paper of average quality. The flow and lubrication are quite good indeed, and in my opinion, much better than Diamine Damson which I find to be a little less lubricating than I’d like. The shading is absolutely marvelous. This is one of the best shading purples I own. The only downside for me is that it is not at all water resistant. AT ALL. Note: This ink is a part of Diamine’s Bespoke Ink series. It is only available directly from Diamine and only in the 30ml bottles. I’m hoping that they choose to make it a permanent part of their line up. For myself, I’ll be ordering a couple more bottles just to be sure to have enough on hand.